On this date in 1919 in the North End neighborhood of Boston, Massachusetts. 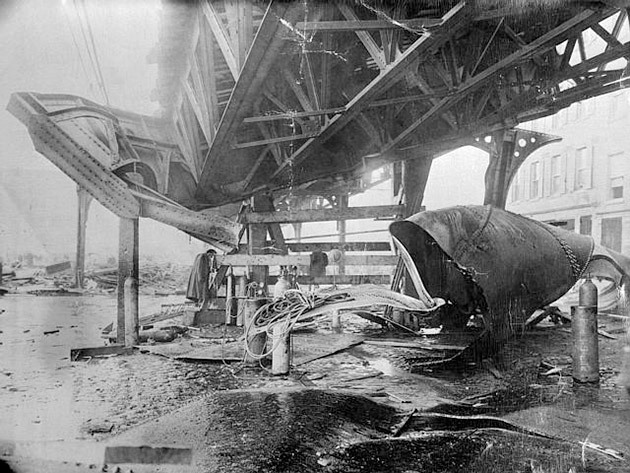 A large molasses storage tank burst and a wave of molasses rushed through the streets at an estimated 35 mph, killing 21 and injuring 150. 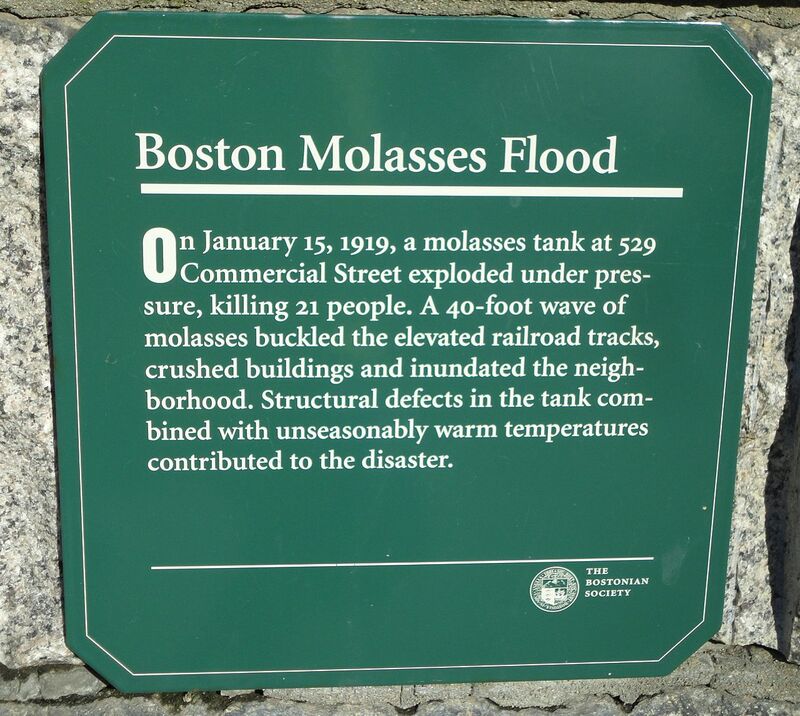 The event is known as the Great Molasses Flood, also known as the Boston Molasses Disaster or the Great Boston Molasses Flood. The disaster occurred at the Purity Distilling Company facility (although a Washington Post article names U.S. Industrial Alcohol as the tank’s owner). 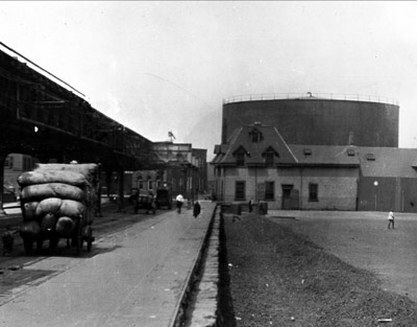 The stored molasses was awaiting transfer to the Purity plant situated between Willow Street and what is now named Evereteze Way, in Cambridge. 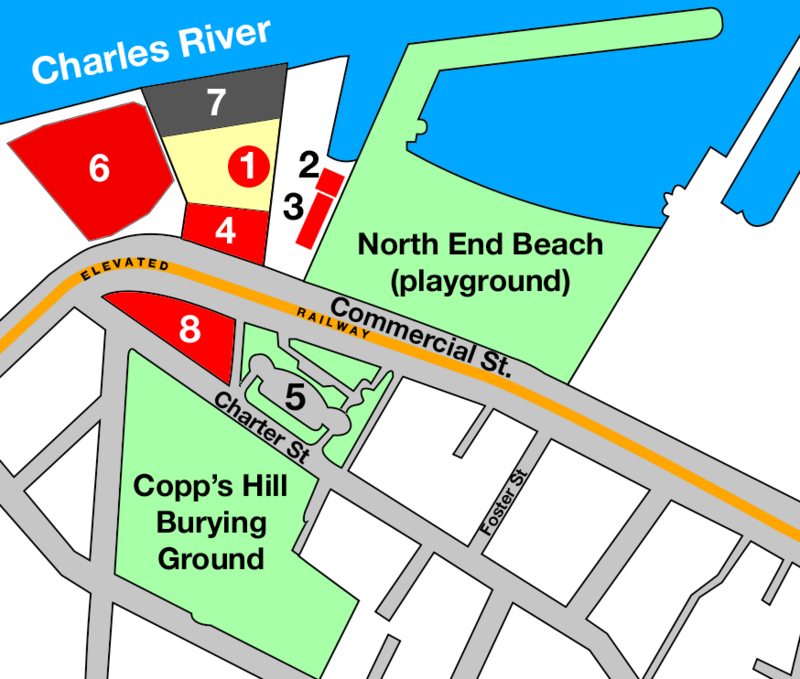 At about 12:30 in the afternoon near Keany Square, at 529 Commercial Street, a molasses tank 50 ft tall, 90 ft in diameter, and containing as much as 2,300,000 US gallons, collapsed. Witnesses variously reported that as it collapsed they felt the ground shake and heard a roar, a long rumble similar to the passing of an elevated train, a tremendous crashing, a deep growling, or “a thunderclap-like bang!”, and as the rivets shot out of the tank, a machine gun-like sound. Molasses, waist deep, covered the street and swirled and bubbled about the wreckage … Here and there struggled a form‍—‌whether it was animal or human being was impossible to tell. Only an upheaval, a thrashing about in the sticky mass, showed where any life was … Horses died like so many flies on sticky fly-paper. The more they struggled, the deeper in the mess they were ensnared. Human beings‍—‌men and women‍—‌suffered likewise. Anthony di Stasio, walking homeward with his sisters from the Michelangelo School, was picked up by the wave and carried, tumbling on its crest, almost as though he were surfing. Then he grounded and the molasses rolled him like a pebble as the wave diminished. He heard his mother call his name and couldn’t answer, his throat was so clogged with the smothering goo. He passed out, then opened his eyes to find three of his four sisters staring at him. First to the scene were 116 cadets under the direction of Lieutenant Commander H. J. Copeland from USS Nantucket, a training ship of the Massachusetts Nautical School (which is now the Massachusetts Maritime Academy), that was docked nearby at the playground pier. They ran several blocks toward the accident. They worked to keep the curious from getting in the way of the rescuers, while others entered into the knee-deep, sticky mess to pull out the survivors. Soon, the Boston Police, Red Cross, Army, and other Navy personnel arrived. Some nurses from the Red Cross dove into the molasses, while others tended to the injured, keeping them warm and keeping the exhausted workers fed. Many of these people worked through the night. The injured were so numerous that doctors and surgeons set up a makeshift hospital in a nearby building. Rescuers found it difficult to make their way through the syrup to help the victims. 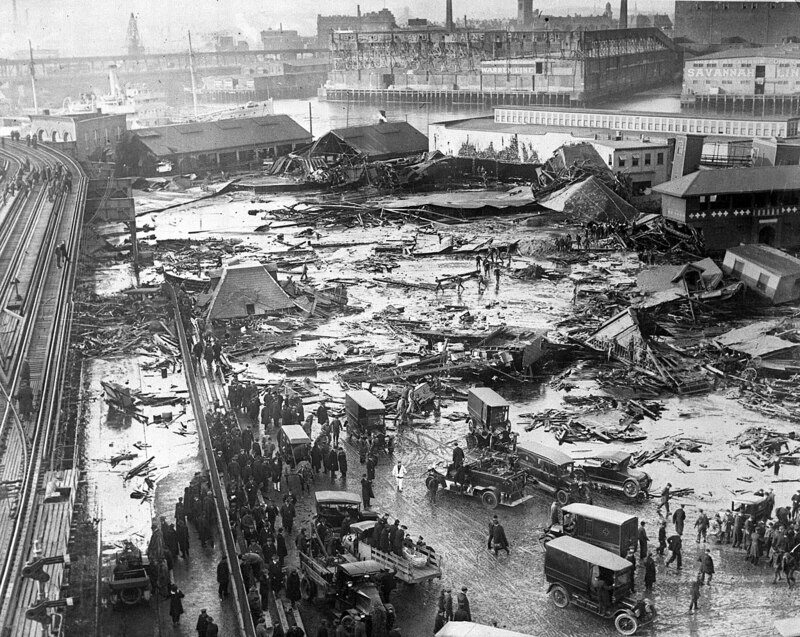 Four days elapsed before they stopped searching for victims; many of the dead were so glazed over in molasses, they were hard to recognize. 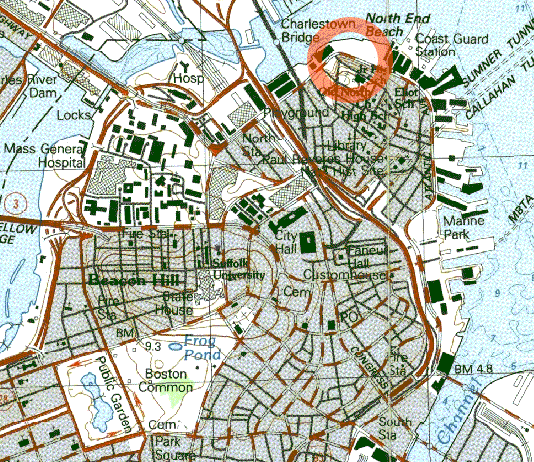 Other victims were swept into Boston Harbor and were only found three to four months after the disaster. Local residents brought a class-action lawsuit, one of the first held in Massachusetts, against the United States Industrial Alcohol Company (USIA), which had bought Purity Distilling in 1917. The lawsuit is considered a milestone in paving the way for modern corporate regulation. In spite of the company’s attempts to claim that the tank had been blown up by anarchists (because some of the alcohol produced was to be used in making munitions), a court-appointed auditor found USIA responsible after three years of hearings. United States Industrial Alcohol Company ultimately paid out $628,000 in damages ($9.08 million in 2018, adjusted for inflation). Relatives of those killed reportedly received around $7,000 per victim (equivalent to $101,000 in 2018). Several factors that occurred on that day and the previous days might have contributed to the disaster. The tank was constructed poorly and tested insufficiently. Due to fermentation occurring within the tank, carbon dioxide production might have raised the internal pressure. The rise in local temperatures that occurred over the previous day also would have assisted in building this pressure. Records show that the air temperature rose from 2 to 41 °F (−17 to 5.0 °C) over that period. The failure occurred from a manhole cover near the base of the tank, and a fatigue crack there possibly grew to the point of criticality. The hoop stress is greatest near the base of a filled cylindrical tank.The tank had been filled to capacity only eight times since it was built a few years previously, putting the walls under an intermittent, cyclical load. Several authors say that the Purity Distilling Company was (or may have been) trying to outrace prohibition in the United States. The Eighteenth Amendment to the Constitution of the United States was ratified the next day (January 16, 1919), and took effect one year later. An inquiry after the disaster revealed that Arthur Jell, who oversaw the construction, neglected basic safety tests, such as filling the tank with water to check for leaks. When filled with molasses, the tank leaked so badly that it was painted brown to hide the leaks. Local residents collected leaked molasses for their homes. An investigation first published in 2014, applying modern engineering analysis, found that the steel was not only half as thick as it should have been for a tank of its size, even with the lax standards of the day, but it also lacked manganese and was made more brittle as a result. Two days before the disaster, warmer molasses had been added to the tank, reducing the viscosity of the fluid. 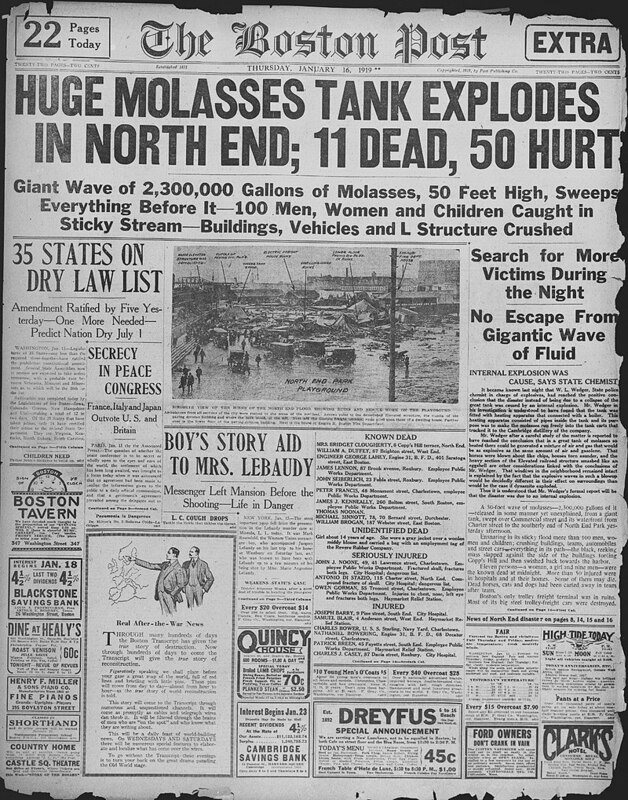 When the tank collapsed the fluid cooled quickly as it spread, until it reached Boston’s winter evening temperatures and the viscosity increased dramatically, trapping victims and hampering rescue efforts. No prizes for guessing today’s recipe ingredient. Cane molasses is an ingredient used in baking and cooking that was popular in the Americas and Britain prior to the 20th century, when it used to be a common sweetener. To make molasses, sugar cane is harvested and stripped of leaves. Its juice is extracted, usually by cutting, crushing, or mashing. The juice is boiled to concentrate it, promoting sugar crystallization. The result of this first boiling is called first syrup, and it has the highest sugar content. First syrup is usually referred to in the Southern states of the United States as cane syrup, as opposed to molasses. Second molasses is created from a second boiling and sugar extraction, and has a slightly bitter taste. The third boiling of the sugar syrup yields dark, viscous blackstrap molasses, known for its robust flavor. The majority of sucrose from the original juice has crystallized and been removed. The caloric content of blackstrap molasses is mostly due to the small remaining sugar content. In Britain this third boiling produces black treacle. In the 1950s I enjoyed treacle tarts made with black treacle, but in the 1960s in Britain, Golden Syrup became much more popular because it is sweeter and milder. In the US in the 1970s, however, I discovered that molasses was alive and well, and used in tart recipes in the South when I lived in North Carolina. 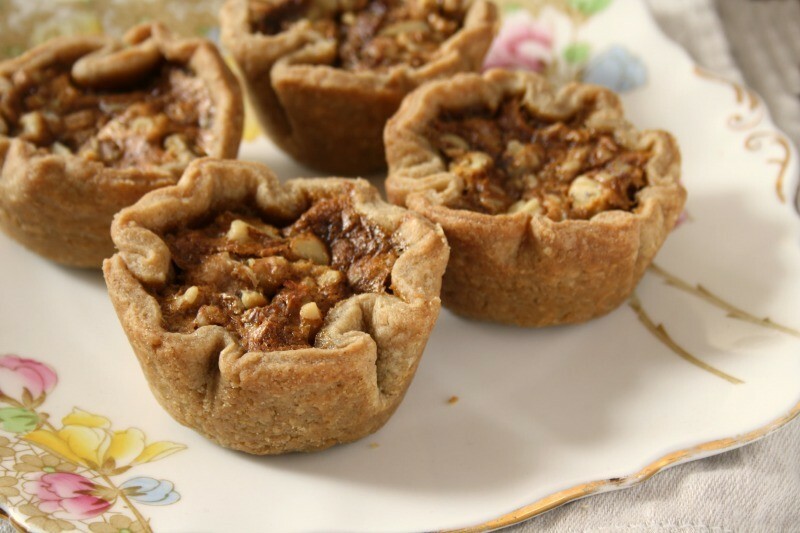 Here is a serviceable recipe for molasses tarts with nuts. Grease a 12-cup tart (or muffin) tin. Cut out 12 circles of pastry to line each cup. Beat the brown sugar, molasses and butter together in a stand mixer until fluffy. Beat in the eggs one at a time, then add the vinegar and vanilla. Pour the mixture into the pastry cups until they are ¾ full and top them with the chopped walnuts. Bake the tarts for 20-25 minutes until the filling starts to dome and set, and the pastry is golden. Cool the tarts in the tin. When they are close to room temperature, remove them from the tin and serve.